The inspiration behind our Gypsy Garden yarn comes from the insanely amazing trim markets of Hong Kong. They are jam packed with gorgeous ribbons, flower appliques and novelty trims. 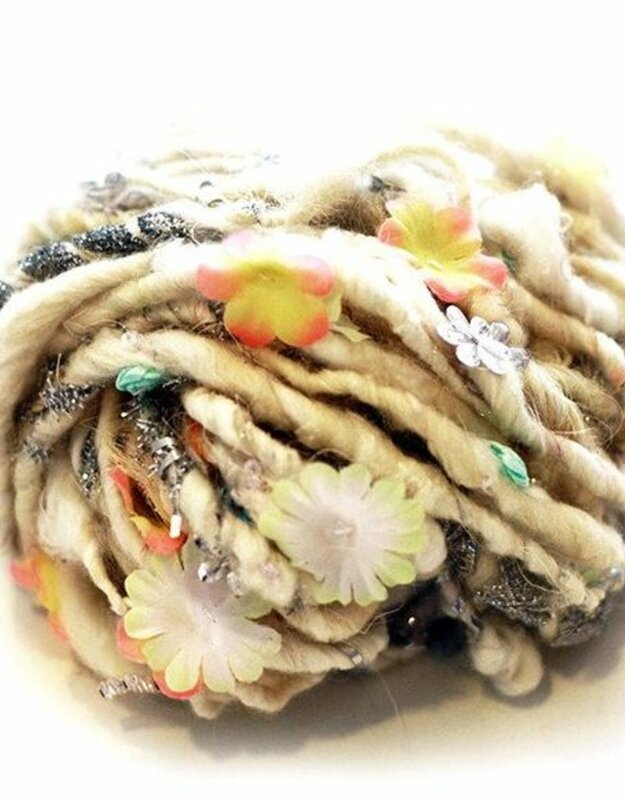 In Gypsy Garden, various colors of wool, mohair, and sparkling Angeina fibers are hand carded together to create beautiful heathered colors. 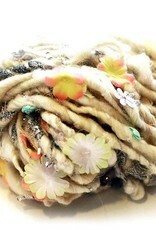 The fiber is then hand spun with tiny flower trims, sequins, bits of lace and ribbon rosebuds. Fluffy, lightweight and a touch slubby, this yarn conjures up thoughts of fairytale dreamscapes and secret gardens. Each color combination has its own unique set of trims and colors. Even though the raw materials are the same, no two skeins are completely alike because of the intense handmade process that goes into each and every skein.